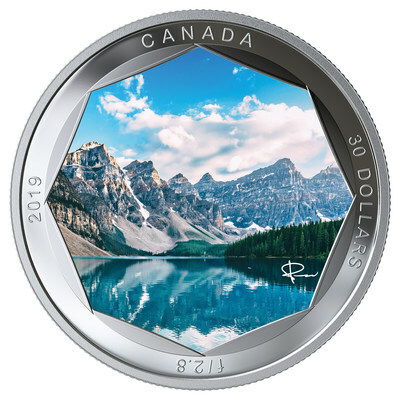 OTTAWA, Ontario, April 3, 2019 /PRNewswire/ -- Always eager to showcase Canadian talent, the Royal Canadian Mint is collaborating with star photographer and video blogger Peter McKinnon to produce an innovative coin series featuring three of Canada's most famous landscapes. The series begins with Alberta's Moraine Lake, captured in full colour on a 2 oz. fine silver coin, surrounded by an edge engraving of the aperture blades of the camera's lens. Photography buffs will surely recognize the "f-stop" aperture setting engraved on one of the blades. This coin displaying the photographer's signature, instead of classic initials, is now available for purchase.